Editor's Note: Due to weather delays, NASA is now targeting a Monday (July 23) launch date for the IRVE-3 inflatable heat shield prototype launch. The launch from Wallops Flight Facility in Virginia is slated for between 6:45 a.m. and 7:45 a.m. EDT (1045 and 1145 GMT). See the end of this story for a link to watch the launch live. When you think of the blistering, brutal re-entry temperatures generated by plowing through Earth’s atmosphere, using fabric doesn’t come quickly to mind. But NASA is set to try some fabric out this Saturday (July 21), as part of a novel inflatable re-entry experiment that could find a variety of uses, both off planet and possibly in returning payloads from the International Space Station as well. The Inflatable Re-entry Vehicle Experiment III, or IRVE-3, has been years in the making for all of 20 minutes of suborbital flight. It will be rocketed to high altitude above Earth from NASA’s Wallops Flight Facility near Chincoteague Island, Va., then will dive into the Atlantic Ocean. It’s all “science friction” — pushing the envelope, quite literally, while trying to beat the heat of atmospheric re-entry. The uninflated IRVE-3 is carefully stuffed into a flight bag that fits inside the rocket’s nose cone. Once IRVE-3 is released at its target altitude, its high-tech inner tubes will be inflated by nitrogen to give the experimental heat shield a mushroom shape. The 10-foot- diameter Inflatable Reentry Vehicle Experiment (IRVE-3) is packed, uninflated, into a flight bag that fits inside a 22-inch diameter nose cone. The experiment will launch on a suborbital rocket July 21, 2012. The ready-for-re-entry contour is made of layers of silicone-coated industrial fabric. As the tubes are inflated, they stretch out a thermal blanket covering them to create a heat shield known as an aeroshell. During re-entry, video cameras will transmit images to the Wallops control room to confirm that the IRVE-3 is holding up during its heat-defying trek. Instruments on board will also transmit temperature and pressure data to researchers for later analysis. A rigorous ground test program of IRVE-3’s thermal protection system has already been performed using a number of facilities, Cheatwood told SPACE.com. But the upcoming flight will use the Earth’s atmosphere as an ultimate test. IRVE-3 will be lobbed some 350 miles (560 kilometers) downrange into Atlantic Ocean waters. NASA’s Office of the Chief Technologist (OCT) is behind the Hypersonic Inflatable Aerodynamic Decelerator (HIAD) project, under which the IRVE-3 experiment is being carried out. IRVE work is one venture within the office's OCT’s Game Changing Development program for new space technologies. Materials that layered together can withstand up to 2,300 degrees Fahrenheit (1,260 degree Celsius) make up the Inflatable Re-entry Vehicle Experiment (IRVE-3) thermal blanket. The experiment will launch on July 21, 2012. Image posted July 17. Testing of the IRVE over the years has seen both malfunction and success. A booster failure cut short its first flight in September 2007. "The original Inflatable Re-entry Vehicle Experiment was designed to demonstrate that inflatable structures could inflate, remain inflated, and maintain stability," said Kathy Barnstorff, a Langley center spokeswoman for the project. "However, IRVE encountered a failure after launch in which the IRVE instrument was unable to separate from the metal payload cylinder surrounding it." In August 2009, IRVE scored its first success. Riding on a Black Brant 9 rocket, the booster reached a high point of 131 miles (211 km), where it began its descent to supersonic speed. Less than a minute later the IRVE-2 was released to inflate in less than 90 seconds at an altitude of 124 miles (200 km). Cheatwood recalls that the 2009 flight verified the IRVE was stable when it was inflated to its profile. It behaved like a rigid blunt body of the same shape, he said, making it through the heat pulse. "The experiment really was … just to take us through the heat pulse. It was like a 30-second experiment, officially," Cheatwood added. "It flew right through supersonic, transonic, into subsonic." IRVE-3 is the same size — nearly 10 feet wide (3 meters) when inflated — as the other two. "IRVE-3 is launching on a larger rocket which will take it to a higher altitude," Barnstorff told SPACE.com. "It will come back in with a higher velocity and more heating than IRVE-2 saw. IRVE-3 will see about 10 times the heating that IRVE-2 did. It’s a heavier payload, which also contributes to the higher heat levels." The High Energy Atmospheric Re-entry Test (HEART) is a design concept for a flight test that would demonstrate a larger inflatable aeroshell,HIAD with a diameter of almost 30 feet (8 meters). Such a craft could one day be used to return substantial payloads to Earth from orbit. Cheatwood said that work is ongoing in thermal protection materials that can take even greater heat loads. "That would let us handle higher heat rates, which means we could be smaller in diameter," he said. On the inflatable space structures side, there’s also an eye toward building larger test articles, Cheatwood said. HIAD-inspired technology is seen as ideal for use on NASA missions, be they to Mars, Venus or even Titan — the largest moon of Saturn. For example, far more precise landings on the Red Planet of robotic craft on the Red Planet are feasible. But the technology is envisioned to be scalable for piloted expeditions to Mars, too. 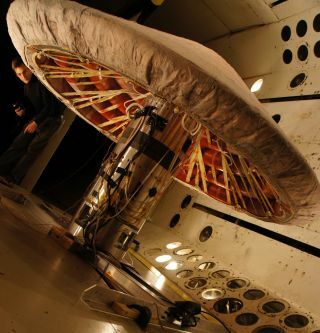 Adopting inflatable heat shields could lead to landing more mass on Mars at higher surface elevations. The larger the diameter of a protective aeroshell, the bigger the payload can be. The HIAD work can also be applied to Earth-returning payloads let loose from the International Space Station. Already being sketched out is the High Energy Atmospheric Re-entry Test (HEART) — a design concept for a flight test that would utilize larger inflatable re-entry technology with a diameter of almost 30 feet (8 meters). Here’s the bottom line for Cheatwood: "If a planet has an atmosphere … we can use it."